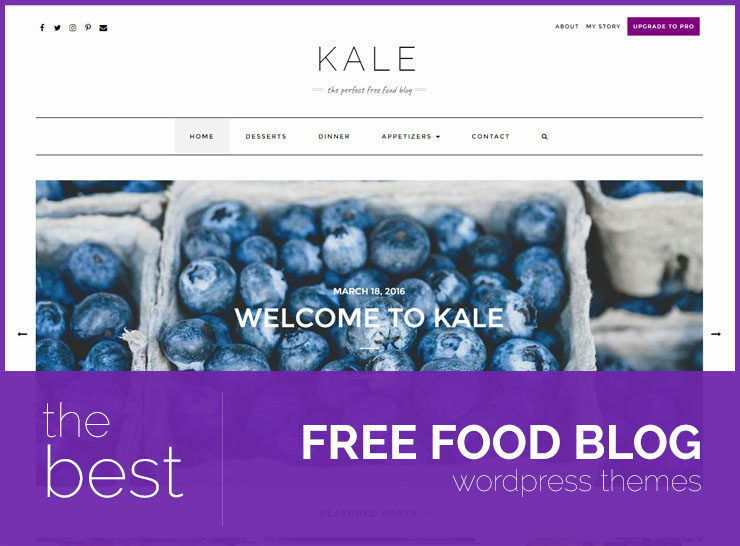 Want to go through some of the latest and Best Restaurant WordPress Themes so you can decide on choosing which one is best for your business? Look no further! Having a restaurant with no online presence in today’s world is unthinkable. But building a website for your cafe or restaurant should not be a daunting task. 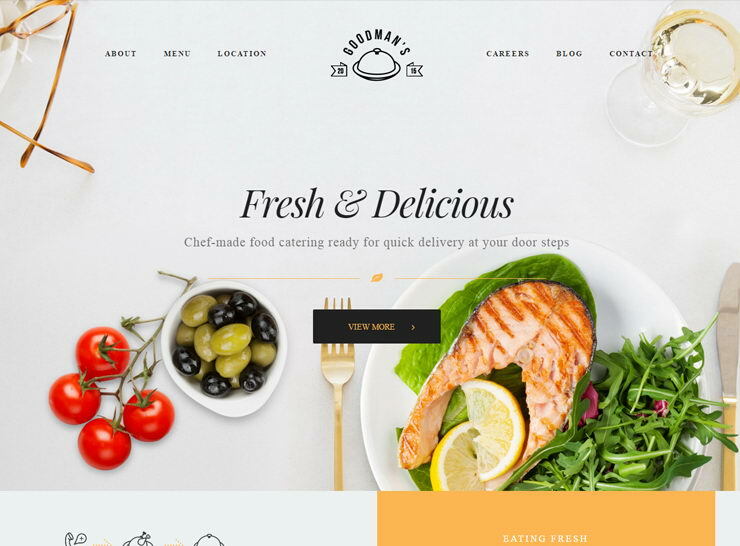 Some great restaurant WordPress themes are available on the market today that make the job of creating a full fledged, featured packed, visually appealing website with class and character quite easy and efficient. Find below a comprehensive list of some of the best and latest restaurant and cafe WordPress themes. If you are looking to share recipes and write about your culinary experience, you would need a personal blogging theme – have a look at these food blog themes. Whether it is to find out what time you open or close, or take a good look at your menu before walking in to your establishment – a restaurant website is a vital cog in the operation of your business. Implementing effective marketing strategies is next to impossible without an impressive, engaging, and sophisticated online presence. In today’s world where most of the website traffic comes from handheld devices, it will be very important for your website to be mobile and tablet ready. All of the websites in our collection below are fully responsive and display beautifully on all kinds of phones. Most of these templates come integrated with WooCommerce so you can sell online, OpenTable so you can reserve tables right from the website, and WPML so you can have a website in a language of your choosing – all incredibly important to built a solid, dependable website presence that plays a significant role in your overall business success. Some of these restaurant WordPress themes come packaged with pre-built niche layouts, such as those for Mexican restaurants, delis, donut shops, breweries, bars, Thai restaurants, burger joints, steakhouses, and many more. Starting with a pre-made layout and then customizing it to match your brand takes away the grunt work and guarantees an stunningly engaging, flexible and modern responsive WordPress restaurant website in little to no time. Each of the links below opens in a new window/tab so you can go through the ones you find appealing before making a final decision. These are some of the best restaurant WordPress themes of the year, can be set up with some customization without the help of a developer. All these restaurant themes require a self-hosted WordPress site. 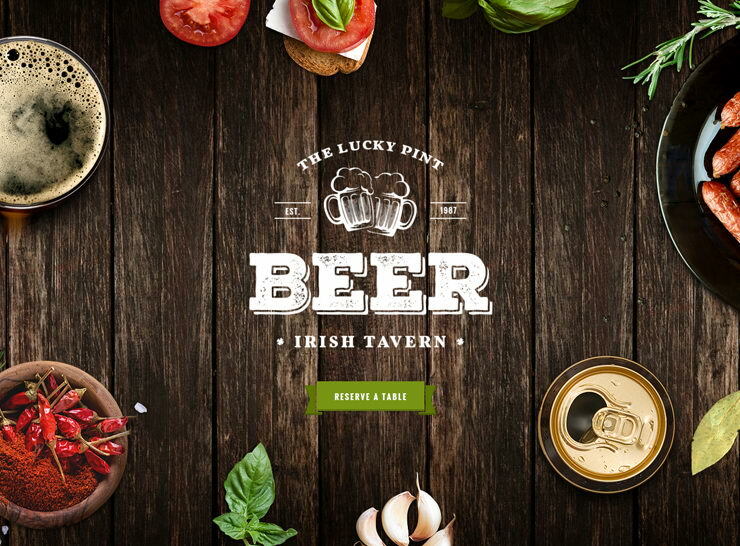 Tavern is a well-designed, modern, minimalist theme that is flexible enough for any cafe, restaurant, bar, or deli. It is fully responsive so it looks and works great on mobile devices, tablets and computers. The theme comes with 3 pre-built home page options so you can choose the one that best suits your business and content. There are different menu formats that can be used, with any without images, on a dark or light background. The full WooCommerce integration means that the theme comes ready to start selling items online. The theme comes packed with 4 different gallery layouts so you can showcase your eatery and enticing pictures of your food offerings in the best possible manner. The theme has a reservation system as well as an event management plugin integrated which means you can take bookings right from your website. Tavern is loaded with features yet the design is welcoming and simple enough to adapt to any restaurant, cafe, or bar. Some highlights of the Tavern WordPress theme are: one-click demo install, WP Booking Calendar plugin integrated, 3 portfolio styles, integrated Tribe Events WordPress plugin, visual composer, translation ready, media content manager, WooCommerce ready, PO composer, Essential Grid, SEO ready, Revolution Slider, 3 home page layouts, 2 header styles, special niche sub pages, widgets such as Flickr, Twitter, Instagram, reviews, advertisements, and more. the many home page blocks, and the full width sliders that can be added to any internal page. The menu page is is unique in its design, unlike any other theme offers. It is also very easy to build. You can create different sections for lunch, dinner, appetizers, etc. along with product titles, descriptions, and prices. Since the theme comes fully integrated with WooCommerce, you can also sell your products online. The intuitive setup of the theme keeps the visitors’ focus on the food you offer while keeping the reader engrossed in your story. It tells an engrossing tale, enticing the reader to visit your establishment. Rosa gives you every opportunity to show off your restaurant. 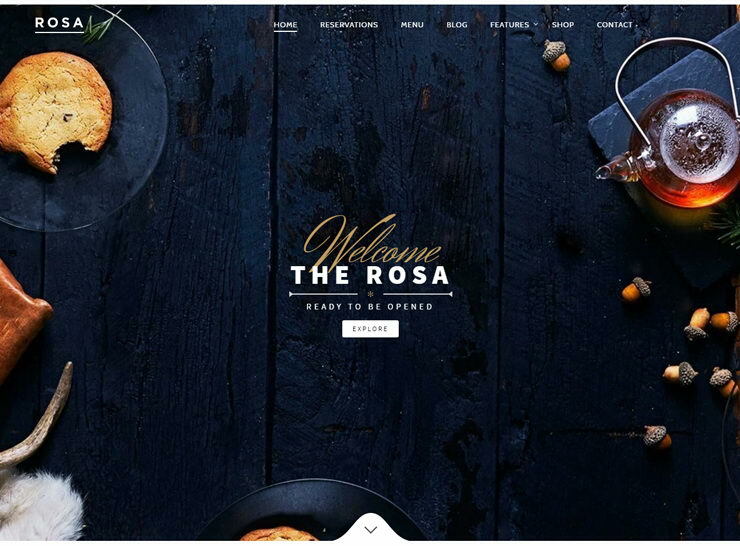 When it comes to showing off your restaurant, Rosa is a beautiful and easy-to-use theme that gets the job done. 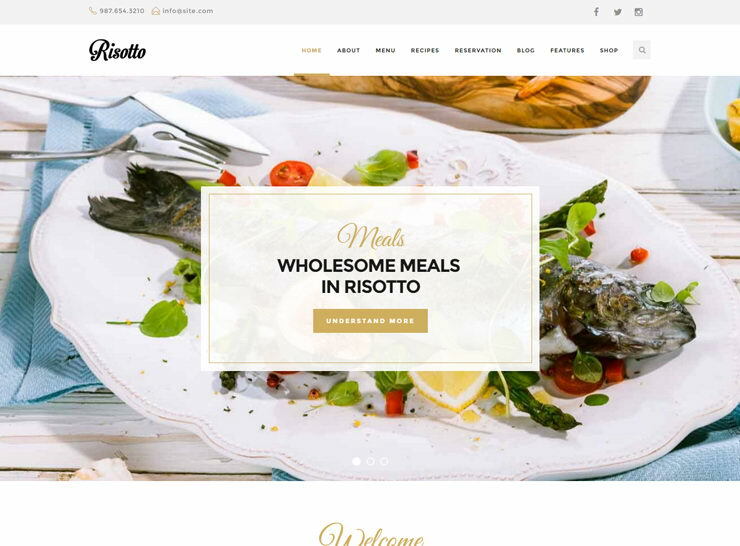 If your customers expect nothing but the best quality from your restaurant, then Rosa is the perfect restaurant WordPress theme to create your beautifully engaging website that exudes that same quality and perfection that you offer at your establishment. Key features of Rosa are: extremely smooth parallax scrolling, beautiful product menus, reservations using the OpenTable system, WooCommerce ready, powerful options panel, SEO friendly, translation ready, 600+ Google fonts, visual shortcodes, one-click demo install, PSD files included. 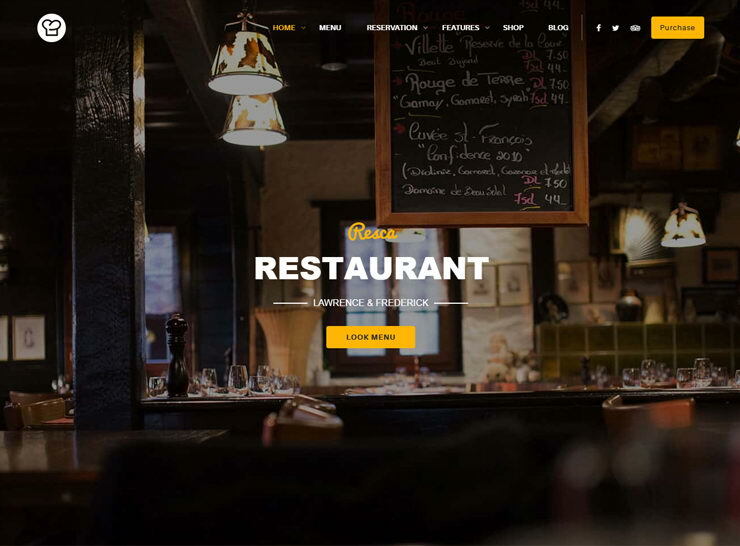 Piquant is an engaging and inviting WordPress theme for a theme for restaurants, bars, and cafes. If you’re looking for a WordPress theme for your eatery that is incredibly refined and perfectly suited for an elegant, upscale establishment – look no further. It comes loaded with 6 main home page styles: original, health food, restaurant, BBQ, bar and cafe, and a full screen layout. It comes with a great blog layout where you can share recent events, new menu items, recipes, or seasonal announcements. There is also a section on the home page where you can share coupons, offers, and other important information so that it is readily available for the customers to view. The theme has a bold black and white design interspersed with highlights of yellow. The design is professionally graphically designed and very carefully crafted, overall taking inspiration from small cafe and diner blackboards used to display menu items and announcements. 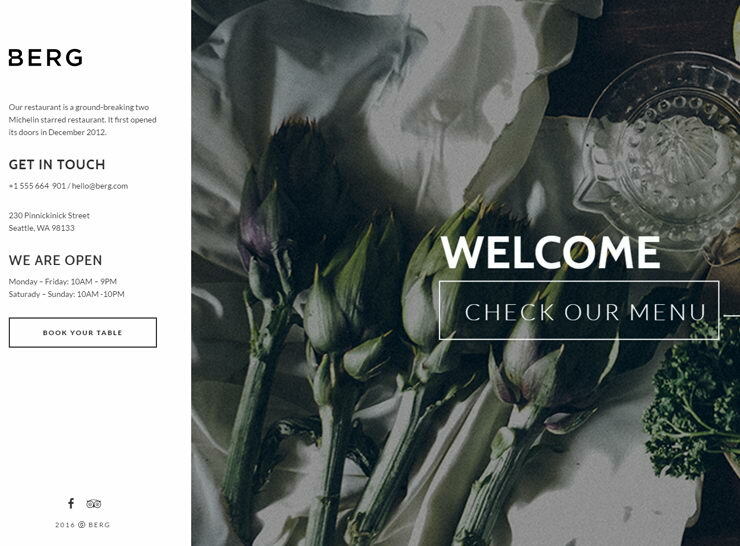 One of the major features of this theme is the multitude of ways you can showcase your menu. You have at least five different options, from just lists, to lists with galleries, or a grid of images to showcase your full product portfolio. If you sell anything online, the theme comes fully integrated with WooCommerce so setting up a store will be a breeze. As expected of any restaurant WordPress theme, Piquant comes fully integrated with the OpenTable system so you can take reservations straight from the website. There are many areas where you can showcase your story, your products, and photos as well as any special announcements, deals of the day, or chef’s specials. Key features of Piquant: 6 home page styles, 5 menu page styles, WooCommerce ready, OpenTable integration, one-click demo import, Visual Composer, Slider Revolution, Twitter and Instagram feed widgets, icon packs included, Mikado options panel, beautiful page examples and templates, customizable Google maps, mega menu, parallax sections, restaurant menu and reservation form shortcodes. The Core is a very flexible WordPress theme that boasts 16 “Handbuilt, Beautiful & Solid WordPress Websites” all in one theme. 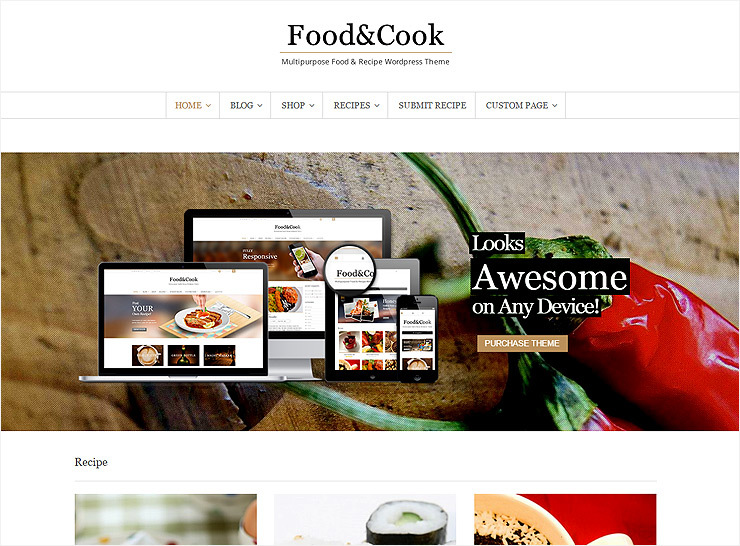 Two of The Core’s layouts are for restaurant or bakery websites. Since these were specifically built for their respective industries, the theme guarantees that everything including layout, colors, and content placement is well thought out and executed. Each website is unique with the proper design style for that specific industry. 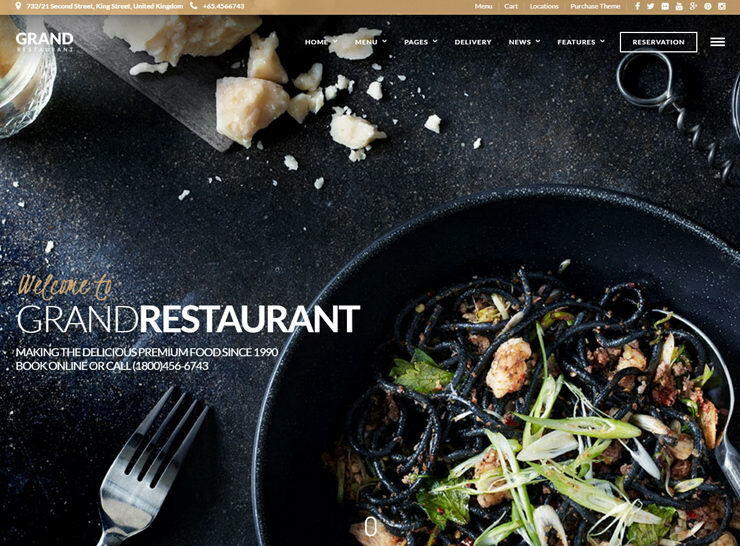 The Core – Gourmet is specifically designed for a restaurant with a stunning full page image to greet the user when the page first loads. The theme design has a lot of white space and openness and the design allows for emphasis on multiple aspects of your restaurant business. The main page shows the current week’s menu in a sleek and beautiful style with room for testimonials and more restaurant highlights down the page. Some of the best features of The Core are: 16 websites in one, each design spefically crafted for its particular industry, advanced visual builder, demo content install, Slider Revolution, Layers Slider, custom-built slider, WooCommerce ready, mega menu, shortcodes, Google Fonts, translation ready, SEO options, portfolio showcases, Unyson framework, contact form builder, sticky header, backup module, Google maps, BuddyPress ready, bbPress ready, donations ready. The Flavour is a modern, beautifully designed, responsive, aesthetically clean and efficiently coded restaurant WordPress theme. It comes packaged with a large slider that welcomes the user when they first visit the page, and then a clean and spacious layout that tells the story of your brand in an engaging manner. The theme is fully customizable, easy to use, and very flexible. It supports MegaMenu so a lot of detail for each navigation item can be displayed simply upon hovering over it. It comes with the ability to beautifully display your gallery of photos, events calendar, and testimonials. The food menus are delicately designed, with little images next to the food items properly sectioned into their own categories. You can use the color picker to customize the color of the website to match your brand, and the events calendar can be used to highlight and promote upcoming promotions, tastings, or special offerings. 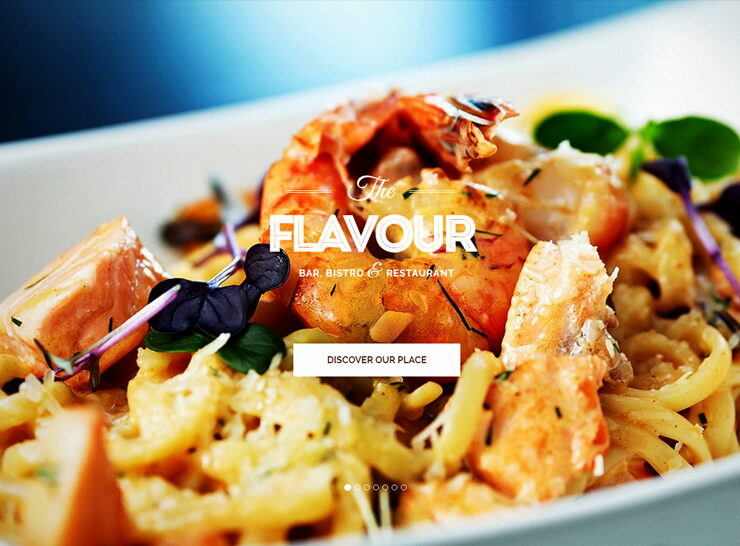 Sage is an excellent choice for a great looking restaurant website. Whether you have a donut shop, an Indian food restaurant, winery or bar, seafood joint, or a steakhouse – Sage has something for everyone! It’s strength lies in the 40 restaurant-specific layouts it ships with, all ready to be installed with a single click. With each layout, you can tweak the many features with simple drag and drop functionality and visual page builders. Each layout is well thought out for the particular niche it was designed for, so you won’t have to do much thinking and just dive right into the setup and customization of your beautiful website. 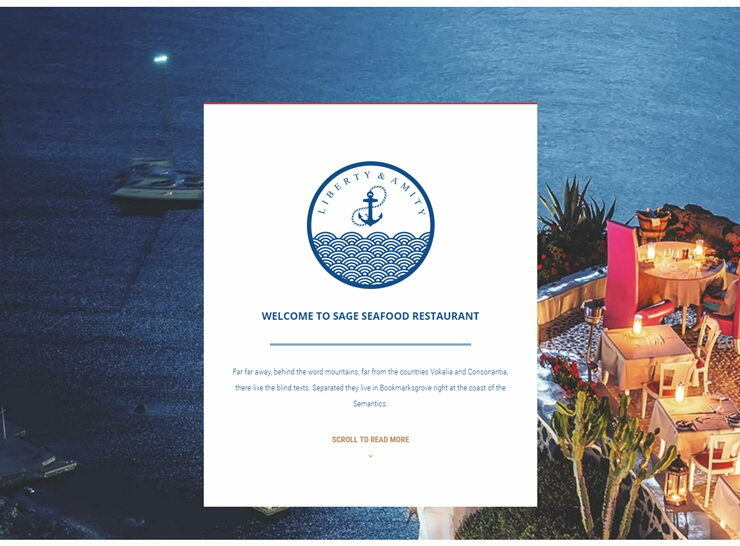 Sage comes with some very handsome layouts and page templates for every imaginable need your cafe or eatery website may encounter. It is translation ready and comes integrated with WooCommerce if you have any wares to sell online. From Mexican food restaurants, to street food, tea houses, and beweries – Sage has thought of everything. Key features of Sage: 40 demos, 20 menu pages, 80+ page elements, 4 add ons, 1 click install, 2 header styles with multiple header behaviors, drag and drop mega menu builder, WooCommerce integration, drag and drop popup builder, quick cart view, slide in panel, info bar, Slider Revolution, Visual Composer, Essential Grid, Google fonts, parallax scrolling, unlimited colors, video backgrounds, translation ready, WPML compatible. Wow !!! a nice list of free best restaurant WordPress themes,, all latest restaurant wp themes is responsive too.. Thank you a ton for this sharing important post.